Jaffa, Israel is claimed to be the oldest port in the world and was founded by Japhet, the son of biblical Noah. Early Egyptian records show that it was conquered by Thutmose III in 1468 BCE. Many myths and tales exist regarding Jaffa. According to Greek legend, it was to one of the rocks on the shore of Jaffa that the god of the sea, Poseidan, chained Andromeda, who was to have been eaten by a sea monster, but instead was rescued by Perseus. According to the Bible, it was from Jaffa that Jonah set sail, before his encounter with the whale, and in Jaffa where Saint Peter raised Tabitha from the dead. From the ancient city of Jaffa you are able to see the skyscrapers of nearby Tel Aviv. This is the old port which is now used by the local fisherman. The main commercial port moved to Tel Aviv years ago. 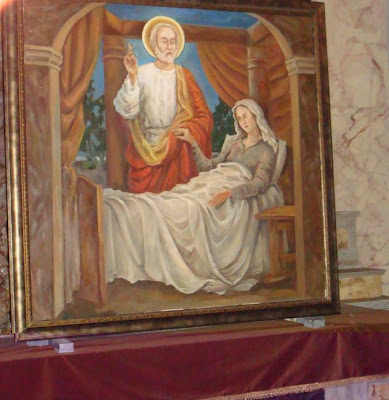 Inside St. Peter’s Franciscan Church above the alter is a painting depicting the “Vision of St. Peter.” Jaffa was the home of Tabitha or Dorcas who St. Peter raised from the dead. 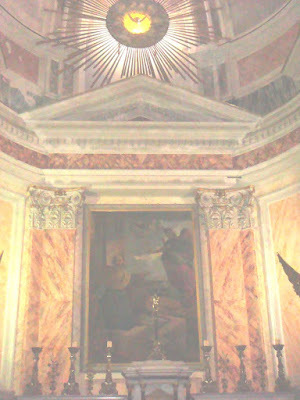 St. Peter’s Church also holds “The Resurrection of the Widow Tabitha, (Dorcas)” above a side alter. Another photo of Tel Aviv from Jaffa. Modern Jaffa has a heterogeneous population of Jews, Christians, and Muslims. Jaffa’s Arab population now numbers around 10,000 people. Jaffa is a major tourist attraction with an exciting combination of ancient, new and restored architecture. It offers art galleries, theaters, souvenir shops, exclusive restaurants, sidewalk cafes, boardwalks and shopping opportunities and a rich variety of culture, entertainment and food- Wiki.